We saved the best until last on Saturday with As De Mee giving an exhibition of jumping the National fences with a stunning victory in the Grand Sefton Chase and Rocky Creek showing a welcome return to form in the London National as dusk beckoned at Sandown. It was a magical way to end a day which saw the stable’s earnings edge past the £1 million mark for the season. Our horses have been on such a tremendous roll these past few months that, weather permitting, I am keen to reach 100 winners before the year is out. With normal luck it should be possible as the pleasing success of Aux Ptits Soins at Kelso on Sunday moved our score on to 85. I thought As De Mee was awesome at Aintree. Although he sulked the previous time at Cheltenham I knew he was in good form at home and was confident that the National fences would bring out the best in him. I doubt I’ve ever seen a novice jump better round there. We’ll keep him to novice company now with the long term target the Topham Chase at Liverpool in April. Rocky Creek astounded me at Sandown because he’s become so hard to predict and seemed to have lost his old appetite for racing. But from the minute he set off at Sandown he was full or himself, jumping for fun, bowling along in front. Then just when it looked as though he would lose his place towards the end of the back straight and drop away he rallied enthusiastically and stayed on bravely to see off the strong challenge of Doing Fine on the flat. Rocky looked amazing in the paddock and has clearly benefited from a few days hunting ridden by Millie Orttewell with the Blackmore and Sparkford Vale pack. We’ve also treated him for a minor back issue. He’s been increasingly in and out over the past 18 months but was definitely on a going day this time. I’ll try to keep him in the same form for the valuable Veterans Chase Final at Sandown on January 7. Marracudja just came up short in the Henry V111 Chase on ground that was more tacky and testing than he enjoys. He prefers bouncing off genuinely good ground and I also suspect he didn’t quite run up to his best against top-class opposition. Le Mercurey excelled himself at Aintree in finishing a close second to the 2015 Grand National winner Many Clouds in the Class 1 Listed Chase. Now we know he stays well it opens up more options for Le Mercurey who will definitely be given an entry for the National. On Friday More Buck’s took another step forward with his latest success at Sandown. He jumps for fun and is on course for a novice handicap chase at Kempton on Boxing Day. He is another of ours I could see running in the Grand National one day. Antarctica De Thaix came agonisingly close to giving us a double at Sandown on Friday before being edged out by Pilgrims Bay who drifted sharply left across her in the closing stages. Most pundits seemed to think we would get the race in the stewards’ room and I agreed with them so it was a bit of a surprise that the result wasn’t changed. Antarctica jumped well, stayed on strongly from the last and will win races as she learns to settle better in front. She could run in a mares novice chase at Wincanton on Boxing Day. 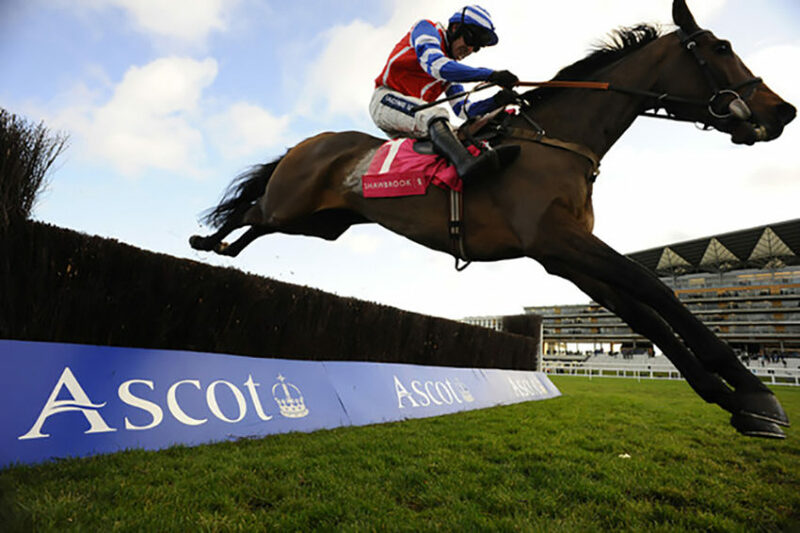 This weekend Frodon and Bouvreuil are on course for the Caspain Caviar Gold Cup at Cheltenham and could be joined by Art Mauresque if he recovers quickly from the little foot problem that prevented him running at Huntingdon on Sunday. In addition Old Guard returns to Cheltenham in a bid to try to win the International Hurdle for the second consecutive year. For all the up to the minute news of our running plans at the weekend please turn to my Betfair column at the end of the week. Fragile Irving scores at Newcastle! Irving’s spirited victory in the Grade 1 Fighting Fifth Hurdle at Newcastle on Saturday was a tremendous result given all his problems this season. He is a horse with legs of glass and I can remember telling Axom’s Dan Downie early this Autumn that he was such a nightmare to train I was worried we would not get anywhere with him. Dan kindly texted me back “If anyone can do it you can”. I can’t say I shared Dan’s confidence but somehow we managed to do plenty with Irving to get him mega fit without galloping him. He has basically done three steady canters up our hill every day with the odd little half speed on our flat gallop and only one schooling session over hurdles because we couldn’t take any chances with him. So I was thrilled and a bit surprised to see Irving win the Fighting Fifth for the second time though he looked to be struggling when he made a mistake four out. He then stayed on well to lead before the second last but was all out to hold the strong late challenge of Apple’s Jade by a whisker. Top marks to his young jockey Harry Cobden for an excellent ride and to the horse who was happy as a lark turned out for an hour on Sunday. He was just a bit stiff, as usual. That’s him but he’s basically fine. It just shows that you don’t have to gallop them hard all the time to get them fit. Irving will have a little break now while we freshen him up so he us unlikely to run anywhere until after Xmas. With Clan Des Obeaux putting in an awesome display in his second chase on Friday and several more running well including Ibis Du Rheu and Warriors Tale the team’s earnings for the season are within a few pounds of £900,00 which is very pleasing. We’ve enjoyed a brilliant run and to have had 80 winners at this stage is quite something when you realise that last season it took us until February 11 to get to 70. Clan Des Obeaux is one of a number of youngsters including Politologue who with normal luck I hope and believe can progress to be Grade 1 performers in the future if we don’t rush them. There were disappointments at the weekend, too, most notably Saphir Du Rheu and Vicente both falling in the Hennessy Gold Cup. Saphir Du Rheu’s early exit was so frustrating because he is a decent jumper but we will not be giving up on him as he has loads of talent while Vicente was staying on steadily when he clipped the top of the second last and come down. I’m delighted to say that Sam Twiston-Davies will be back riding for us again in mid week after missing the best part of two months with a spleen injury. He has been champing at the bit, raring to go, riding out here twice a week and working out in the gym every day so he certainly will not lack for fitness. We will give Sam a gentle introduction on Wednesday or Thursday ahead of a busy weekend when we will have interesting runners at Sandown, Chepstow and Aintree. One race where we don’t have an entry is the Betfair Tingle Creek Chase in which we have a terrific record. It will seem strange watching Saturday’s race without any involvement. Politologue brightens a grey day! Another rewarding week for Team Ditcheat with a treble at our local track Wincanton on Thursday, two more winners on Friday and another double on Saturday. That moved our score on to 77 at a strike rate of almost 33 per cent. The one that thrilled me the most last week was Politologue who, I thought, was awesome in winning the novice chase at Haydock that we have farmed in recent years. I was worried beforehand that he might lack peak fitness as he came back into training later than most of ours. But class horses tend to get away with it and he jumped and travelled like a dream before drawing well clear in the closing stages. While he needs to gain some more experience, he is a proper horse who will improve for the run. Two and a half miles looked ideal for him at Haydock so I am not in a hurry to step him up to three miles. If all goes well further ahead I could see him tackling something like the Betfair Chase in twelve months time. Present Man dug deep to hold on at Ascot on Friday and the two mares Lifeboat Mona and Tagrita did us proud on Saturday. There were disappointments too, with some of our older horses like Zarkandar and Silviniaco Conti struggling to show their true form while the performance of Dodging Bullets at Ascot is a bit of a mystery. I might have been guilty of running Zarkandar and Conti too quickly after their previous races. They both seemed in good form at home but you never know for sure until they get to the racecourse again. Sean Bowen did say that the steady pace at Ascot didn’t suit Zarkandar who we know needs three miles these days. I think the truth is that a few of our older horses including this pair and also Vibrato Valtat are increasingly hard to place. Old Guard hated the ground at Haydock where the slow pace of a four runner race was totally against him. His best form in the Greatwood Hurdle came when he finished powerfully off a flat out gallop. There will be other chances for Old Guard though I do wonder if he is as good as before the pelvic injury that forced him out of the Cheltenham Festival. The good news is that Dodging Bullets was fine on Sunday morning after Nick Scholfield sensibly pulled him up at Ascot because he wasn’t happy with him. The horse got in a right old state before racing, acting strangely. Nick said that he seemed all right in the early stages of the Stella Artois 1965 Chase then stopped as if something was amiss. Yet he had been working beautifully since Exeter and ate up once he was back in his box at Ditcheat on Saturday evening when we checked on him every hour until midnight. What happened is one of those odd things that has left me scratching my head. If only horses could talk! We have another busy weekend ahead with Irving heading to Newcastle seeking to win a second Fighting Fifth Hurdle and Saphir Du Rheu and Vicente both on course for the Hennessy Gold Cup at Newbury’s two day meeting where I expect to field number of runners. Saphir Du Rheu galloped encouragingly on Friday, has improved for his first run and is on a lower mark than last year. But he does now need to put a marker down in the form book. Vicente is 5 lbs higher since winning the Scottish Grand National in the spring. He can go well fresh but wouldn’t want the ground to be too soft at Newbury. For up to the minute news on all my runners at the weekend please turn to my Betfair column late on Thursday and Friday afternoon.